Although she looks brown it’s thought that Cassi, who has buckskin sisters, is actually a dilute black (smokey black). Her owner Sarah describes her as a “totally flat in colour with no shading anywhere, and the same colour summer and winter”. 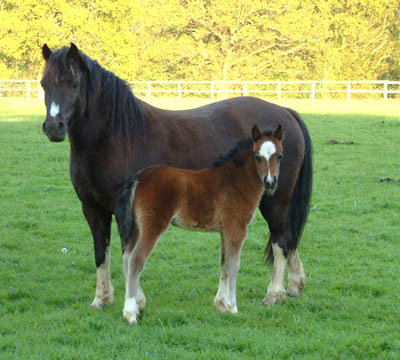 Pictured here with her only foal so far, the dark bay Roy. Sarah is looking forwad to Cassi's future foals. Many thanks to her for sharing this photo and her story with me!